The AIR-STAT outdoor thermostat provides basic control for roof and gutter deicing or pipe freeze protection systems. 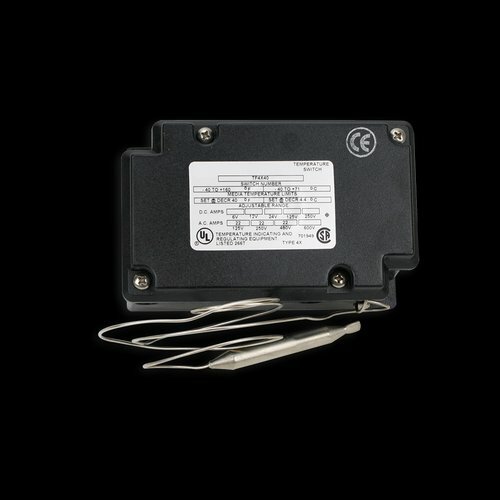 It detects temperature only, activating the system for continuous operation at 40°F or below. The AIR-STAT thermostat is UL Listed and features a NEMA 4X enclosure and a 3 –foot, bulb-and-capillary type sensor. It is rated for a maximum 22 amps and can be used with 120V or 240V roof and gutter deicing systems. Comes with a built-in capillary bulb sensor with a 3 foot sensor lead.